Property Location A stay at Lord Baltimore Hotel places you in the heart of Baltimore, walking distance from St. Paul's Episcopal Church and Baltimore Convention Center. 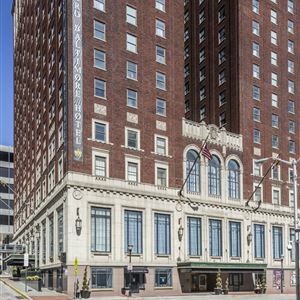 This historic hotel is within close proximity of Everyman Theatre and Baltimore City Hall. Rooms Make yourself at home in one of the 439 air-conditioned rooms featuring refrigerators and LCD televisions. Your room comes with a pillowtop bed. Complimentary wired and wireless Internet access keeps you connected, and cable programming provides entertainment. Private bathrooms with shower/tub combinations feature complimentary toiletries and hair dryers. Amenities Enjoy recreation amenities such as a 24-hour fitness center or take in the view from a rooftop terrace. This hotel also features complimentary wireless Internet access, concierge services, and wedding services. Dining Grab a bite to eat at one of the hotel's dining establishments, which include 2 restaurants and a coffee shop/café. Relax with a refreshing drink at one of the 2 bars/lounges. Cooked-to-order breakfasts are served on weekends from 6:30 AM to 10:30 AM for a fee. Business, Other Amenities Featured amenities include complimentary wired Internet access, a 24-hour business center, and limo/town car service. Planning an event in Baltimore? This hotel has 18,700 square feet (2 square meters) of space consisting of conference space and meeting rooms. Self parking (subject to charges) is available onsite. 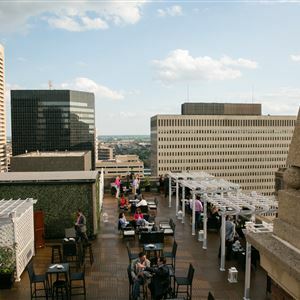 A stay at Lord Baltimore Hotel places you in the heart of Baltimore, walking distance from St. Paul's Episcopal Church and Baltimore Convention Center. This historic hotel is within close proximity of Everyman Theatre and Baltimore City Hall. Make yourself at home in one of the 439 air-conditioned rooms featuring refrigerators and LCD televisions. Your room comes with a pillowtop bed. Complimentary wired and wireless Internet access keeps you connected, and cable programming provides entertainment. Private bathrooms with shower/tub combinations feature complimentary toiletries and hair dryers. Grab a bite to eat at one of the hotel's dining establishments, which include 2 restaurants and a coffee shop/café. Relax with a refreshing drink at one of the 2 bars/lounges. Cooked-to-order breakfasts are served on weekends from 6:30 AM to 10:30 AM for a fee. Featured amenities include complimentary wired Internet access, a 24-hour business center, and limo/town car service. Planning an event in Baltimore? This hotel has 18,700 square feet (2 square meters) of space consisting of conference space and meeting rooms. Self parking (subject to charges) is available onsite.